A Dandie Dinmont Terrier is a small breed of dog in the terrier family. The breed has a very long body, short legs, and a distinctive "top-knot" of hair on the head. This short legged terrier was developed in the 17th century as an otter and badger specialist in the Cheviot and Teviotdale Hills in the border country of Scotland and England. The Dandie Dinmont Terrier is named after Dandie Dinmont, a jovial farmer in Sir Walter Scott's novel Guy Mannering. Scott also gave the names to the breed's colours, pepper and mustard, which were adopted from the names of Dandie Dinmont's dogs. The Dandie Dinmont Terrier is the only breed to be named after a character in fiction. In the 1870s, exhibiting dogs became popular. The Kennel Club formed in 1873 and, just after this time, moves were made by Dandie enthusiasts to form a club. On November 17, 1875, at a meeting held at the Fleece Hotel in Selkirk on the Scottish Borders, the Dandie Dinmont Terrier Club was formed. It is one of the oldest pedigree breed sclubs in the world. The first task was to draw up a breed standard and Mr William Wardlaw Reed, a founder member of the DDTC. worked on this, smoothing out the many differences. The following year at the Red Lion Hotel, Carlisle, the standard was agreed and adopted. The breed was first registered with the American Kennel Club (AKC) in 1888. 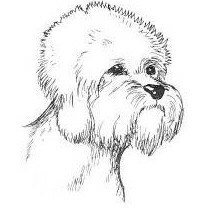 The Dandie Dinmont Terrier was recognized by the United Kennel Club (UKC) in 1918. Today the Dandie Dinmont is amongst the rarest and most endangered of all pure breeds/pedigree dogs. The UK Kennel Club list the Dandie as one of the UK's Vulnerable Native Dog Breeds and there is a very real chance of the breed becoming extinct. Dandie Dinmonts are between 8 and 11 inches tall at the top of the shoulders and can weigh between 18 and 24 pounds. The dogs are sturdily built with strong bone structure and ample muscular strength. The color is either pepper or mustard. Pepper ranges from dark bluish black to a light silvery gray, the topknot is a silvery white. Mustard can range from a reddish brown to a pale fawn, with the topknot a creamy white.